PLAGUE Hey, Abby, can I ask a favor? 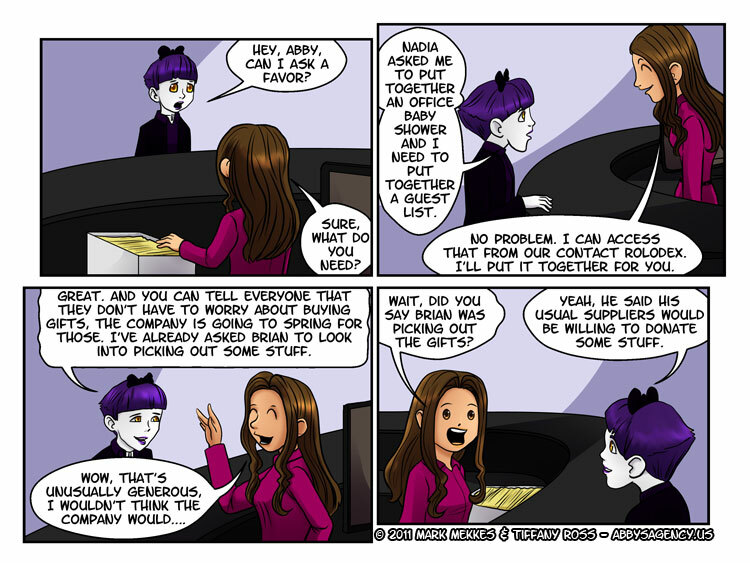 ABBY Sure, what do you need? PLAGUE Nadia asked me to put together an office baby shower and I need to put together a guest list. ABBY No problem. I can access that from our contact rolodex. I’ll put that together for you. PLAGUE Great. And you can tell everyone that they don’t have to worry about buying gifts, the company is going to spring for those. I’ve already asked Brian to look into picking out some stuff. ABBY Wow, that’s unusually generous, I wouldn’t think the company would…. ABBY Wait, did you say Brian was picking out the gifts? PLAGUE Yeah, he said his usual suppliers would be willing to donate some stuff. This seems like it’s not just a test of Kelly’s ability to organize a party. I think it’s a test of whether or not Kelly will either admit that she needs help or accept help if it’s offered. On the plus side, they’ll either save a LOT of money on the gifts or have a lot to sell to recoup the costs.